James is an avowed Buckeyes fan, even going so far as to state that he would have donned the scarlet and grey if he had played college basketball instead of jumping straight to the pros. LeBron also lavished a gift of Beats by Dre headphones on every member of the Ohio State team before Monday's final (not an NCAA violation! ), displaying his loyalty to the cause. It looks like LeBron's presence was all pretty normal, right? Not so much, because LeBron has proven his status as a magnet for criticism and controversy yet again. The issue up for debate now concerns James' status for Tuesday's Cavaliers game at the Phoenix Suns, set to tip off at 7 p.m. in the Mountain time zone. James practiced with the Cavs in Phoenix on Monday morning after having missed eight straight games with pain in his left knee (plus a back strain), a stretch during which the team has gone just 1-7 and seen their record fall to 19-19. ''We struggled and I hate seeing that and I hate seeing us not play to our ability with me sitting out,'' he said. Those quotes would seem to present a player with a clear focus on doing whatever possible to help his team return to the win column and avoid extending the current losing streak to six games. 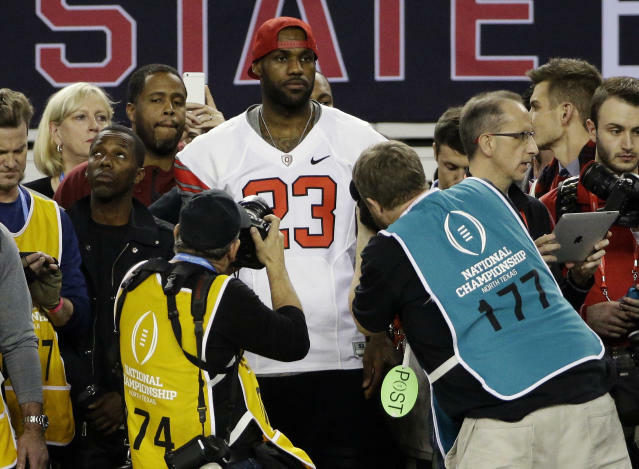 That impression is complicated a bit by the fact that LeBron attended a football game, at night, in a stadium located more than 1,000 miles (or a minimum two-hour plane ride) from the U.S. Airways Center in Phoenix. Can such a person really be 100 percent committed to the Cavs? Well, sure, especially given that he's a multimillionaire with likely access to a private jet (presumably Nike's — they supply both teams' gear and effectively serve as Oregon's PR firm). For that matter, a few late-night plane rides are perfectly normal experiences for a veteran in his 12th NBA season, whether he is injured or in perfectly good health. Plus, on a less specific level, world-famous athletes do this sort of thing all the time. The contemporary superstar's world has more in common with that of a high-powered CEO or movie star than a standard employee who just happens to make a massive salary. Simply put, it was in the best interests of LeBron, Nike and various other global brands for him to show up at this game. A rejection of that state of affairs is primarily a sign that the complaining party has a distorted view of the landscape of America's biggest sports properties. That bygone world of purity and playing for the love of the game hasn't existed for decades, if it ever did at all. The guy is allowed to have some responsible fun. If LeBron misses the game against the Suns, it will have a lot more to do with his two-week absence from the court than his short trip to Texas.